A Kaunakakai property with known contamination from operations of the former Molokai Electric Company is slated for comprehensive testing and cleanup, beginning in the coming year. Maui Electric, which inherited the company but not the site, is initiating the first steps in the effort, and shared their plans with the community last month. “Maui Electric has never operated out of this site, we inherited the site, but we want to make sure we get the site cleaned up and ready to be repurposed into something else,” said Greggory Kresge, Maui Electric environmental compliance engineer. The brownfield property — a term used to describe a former industrial site with hazardous pollutants — is located on the lot currently occupied by Molokai Supply across from Paddlers Inn. Initial tests have shown several toxic contaminants may be present at the site, and Maui Electric, in cooperation with the federal Environmental Protection Agency (EPA) and state Department of Health (DOH), is launching the cleanup process. Kresge said the community expressed interest in using the current industrial site for different community uses, meaning the potential effects of contamination might change. Though she was not present at the meeting, many community members and project leaders credited Karen Holt of the Molokai Community Service Council with raising awareness of the need for the cleanup and spurring the project forward. The site was formerly the generating station for the Molokai Electric Company, which began operation in 1932. In 1985, Molokai Electric relocated operations to the current power plant site at Pala`au, and in 1989, Maui Electric purchased the company and began providing electric service on the island. 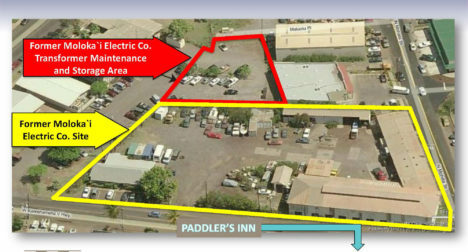 In 1994, the Molokai Planning Commission requested a site investigation from the DOH for the parcel where Paddlers Inn currently stands, according to Maui Electric officials. The results showed no contamination above action levels. In 2000, the EPA conducted a site study, though no further action was taken by the agency until 2010. In 2008, after community interest was expressed in other uses or possible redevelopment of the site, Hawaiian Electric Companies met with the DOH and two years later, the EPA completed another assessment. In 2012, with confirmation of contamination, Maui Electric, the EPA and DOH worked to determine site investigation methods and a work plan for the brownfield. In late 2015, Maui Electric hired Element Environmental to complete the work and prepared the SMA permit applications for the county. Matthew Neal, senior environmental scientist with Element Environmental, said the main contamination concern is with PCBs, which stands for polychlorinated biphenyl, a toxic compound that was used frequently up until the 70s to insulate electric components. He said they don’t degrade easily, but they also don’t move in water so even when it rains, they will remain where are within the soil. He explained that currently, there’s no concern with PCB exposure at the site, but if there was to be any excavation in the future, there would be potential danger from exposure through direct contact or accidental ingesting. Additional contaminants include petroleum and metals. Beverly Pauole-Moore said the building was originally the Molokai Soda Works site, where her father worked after the war. But once it became the electric generating station, she remembered some concerning activities. Other residents also shared stories about what they remember seeing at the brownfield, and project leaders said that type of first-hand information is helpful to the investigation. Kresge said Maui Electric has applied for two different Special Management Area (SMA) permits with Maui County that are required for the project to move forward. One permit will cover work within the expected test area, and the second permit would cover surrounding parcels in case expanded testing is needed. The SMA permit process is lengthy but project leaders said the county has been working with them to move it forward as quickly as possible. The approval process includes a review by the Molokai Planning Commission, as well as a 45 day public comment period. Kresge said if the SMA permits come before the Planning Commission in January, the testing might begin sometime in June. Once work begins, a crew of three to eight people will use a drilling rig about the size of a Bobcat to take many soil core samples at various depths, explained Neal. He said soil will be collected from one foot below the surface down to groundwater level at a depth of five feet. In addition to the soil samples, the crew will drill a series of wells to test the groundwater and soil vapor — or gas — beneath the surface. With the cooperation of the landowners, samples will also be obtained below the concrete floor of the existing building, and will be filled again once the work is complete, said Neal. These tests will meet both federal EPA and state DOH requirements, he added. Starting at the center of the site and working their way outward, the crew will be able to determine the source and extent of any contamination. Neal said if contamination is found near the edges of the primary site, testing will extend out into surrounding properties until a perimeter is identified. Some residents recalled seeing oil slicks on the ground near Paddlers Inn, and Neal said they will be looking for any connection between the Molokai Electric site and any contamination across the street. Neal said the work is expected to start mid year 2017, and once begun, it will take two to three months to collected samples. Kresge added that after the investigation, they will look at options for remediation and cleanup, guided by the results of the field testing, with all work completed by 2020. Fenix Grange, environmental management program manager for the DOH, said it’s hard to predict what might be involved in the cleanup itself. Resident Yama Kaholoaa expressed concern about introducing contaminants to the groundwater supply, as well as the reef, as drilling would be below sea level, he said. Kresge said for additional monitoring, the groundwater wells that will be drilled will remain there for further monitoring to ensure there is no residual contamination in the future. Grange said oil can smear up and down within the soil but it doesn’t move from side to side. She added the DOH has managed many oil cleanups both in the ocean and on land. With small equipment being used, Neal said he doesn’t expect dust to be a problem while drilling, but air monitors on the perimeters of the site will be used to ensure dust is kept to a minimum. Pauole-Moore expressed concern about any financial burden for the cleanup that might be placed on landowners. Though officials could not yet confirm how the project will be funded, Kresge said Maui Electric is taking responsibility for the cleanup and others involved in the effort said federal grants are available for environmental cleanups. Maui Electric officials said there will be many more opportunities for comments and concerns throughout the process.